the phone jangled me from sleep last night at 1:48 a.m.
it is a mother’s first instinct, it is my first instinct, to read the clock when i hear phones ringing in the depth of darkness. it is my initial register that something’s wrong. i stumbled toward the phone, and by the time i got there, i jammed my thumb on the wrong button. i missed the call. the cell phone, though, picked up the chirp, and by then awake enough — and seeing that the number on the face of the phone was the one belonging to our sweet college kid, my heart pounded through my chest wall — i grabbed the call. and so it began. the long surreal night of sirens bleeding everywhere. of trying to sustain internet connection so my laptop would clue me in, where TV was slower to respond. the TV images: SWAT trucks, FBI jackets, men padded in camouflage garb. long-necked assault weapons. a lifeless-looking body lying motionless on the street beside a funeral home that’s not three miles away. but before that, word that just down massachusetts avenue, at MIT, not a mile away from our third-floor aerie, a cop had been killed. and then a high-speed chase down memorial drive, at the bottom of our hill. we stayed awake for hours, trying to make sense of what did not make sense. at last, at nearly 4 we tumbled back to try to sleep. we knew little. all we knew was that mayhem had this town on lock-down. at 6:05 i awoke again. sirens drowned out the birdsong. i found myself alone in bed, nothing but an empty pillow beside me. i tore off the sheets, ran for that lifeline, the laptop. checked for emails, and saw that harvard was closed. the reason: a massive manhunt for “highly dangerous” suspect. a second suspect, we now learned, was dead. 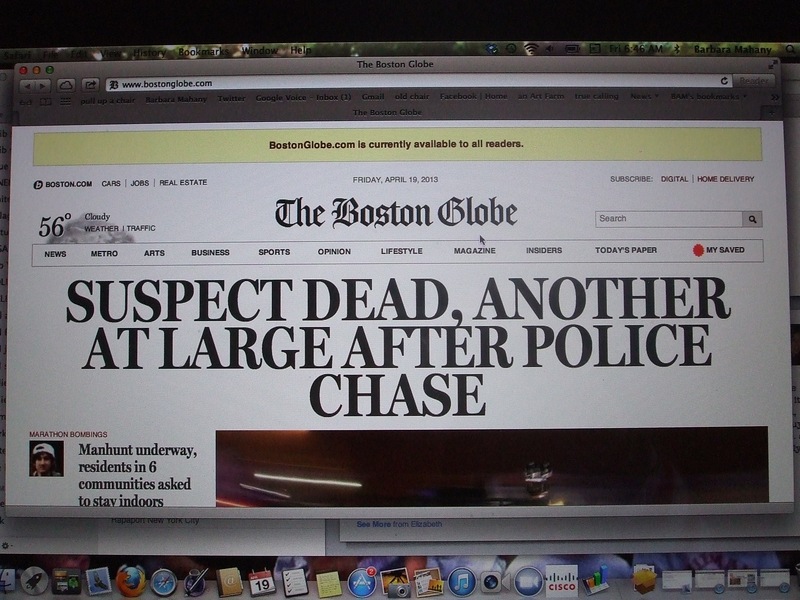 since i can’t ever work the TV clicker, i clicked around the internet, CNN, the boston globe, twitter feeds. it was a blur of SWAT trucks rumbling through the streets, bomb-sniffing dogs, robots dispatched to detonate explosives hurled at first responders. the automated voice on the other end of the line instructed us to “shelter in place” — do not go outdoors, stay inside your homes — due to the ongoing police advisory. “please stay vigilant,” the voice implored. oh, we are vigilant all right. and so grateful that the 11-year-old is sleeping deeply through all of this. he’s been shaken since monday afternoon when the governor and police commissioner got on the television and said to “stay indoors, this is an ongoing police activity,” as reports rolled in of the explosions at the finish line, and an hour and a half later, an explosion at the JFK library. no one knew where the next explosion might blast. all week, it’s been helicopters thwopping through the sky, and sirens shrieking by — on streets right in front of us, and in layers in the distances. i’d not be honest, if i did not say that i’ve been scared, felt exposed, never had the sense that this eery chapter was in any way closed. i steered clear of every metal trash can i passed on massachusetts avenue. i walked in classroom buildings, and thought how odd it was that we were all seamlessly, porously, entering and leaving without a soul asking our intentions. without a single backpack being checked. my little one told me yesterday as i drove him to soccer that, to him, this is all much worse than sandy hook, at least through his eyes, his heart. 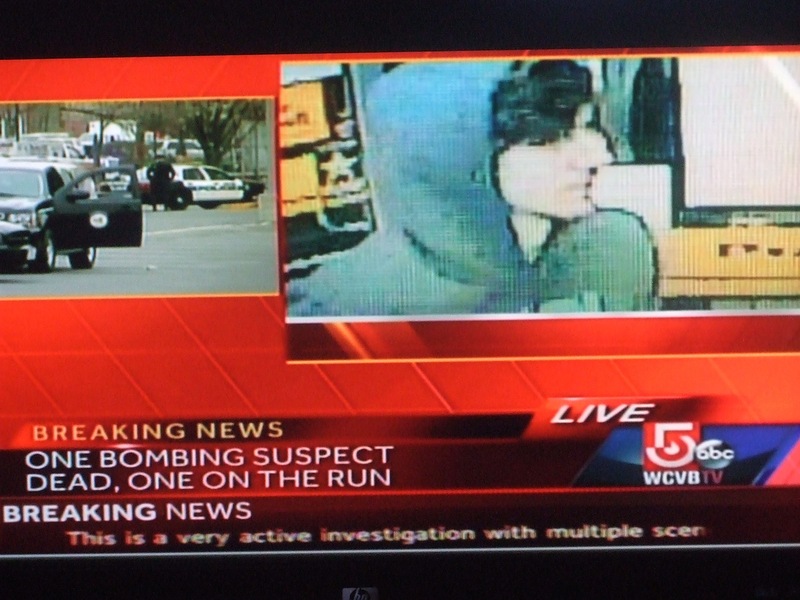 the bombers, he said, “stole the sanctuary” of the boston marathon. “it was something glorious,” he reasoned. and in clear daylight, people who came to cheer, to run, to cross the finish line, got shattered, got killed. as if to make his point in numbers, he asked how many were hurt at the boston marathon, and how many killed at newtown. they are both horrible, i concurred, knowing you do not debate gradations of horrors. he has no idea what’s unfolded since the phone rang in the middle of last night. last night, after a “disturbance call” at MIT, a security guard responding to the scene was shot with multiple gunfire. a black mercedes SUV was carjacked, and the high-speed chase tore along memorial drive, the vast curving roadway just down the hill, the roadway i’ve walked all year for its meditative powers, as it curves along the charles river, the parade of london plane trees marching along its flanks. as i type, the sirens are picking up in tempo, and decibels. it’s as if the pulse of this city is now being metered out in shrill, and undulating pierces. now comes word that one suspect might have been a kid at cambridge-rindge high school, the campus i walk through four to six times a day, a mere four blocks away. as i look out the windows, i see no movement on the cobbled sidewalks below. just got word that the suspect was last seen on a street a few blocks away. we get these messages in blurts, sometimes beginning, “not to scare anyone.” sometimes, cutting straight to the chase. i think i am typing to keep calm. i type because it’s what i do on fridays. if i keep typing, i can turn off the news for a few minutes, can build my shield against what unfolds outside, and not too far away. it’s not supposed to be the college kid worried for his mommo. or his papa. or his little brother. we are safe, thank god. it is the horrors that have torn apart this blessed city that are the focus of my prayers. dear God, deliver them from evil amen…..
bam, I’ve been thinking of you all week. You and your family have been in my thoughts and prayers since this all started on Monday. Please remain safe and vigilant and know that so many are hoping for a resolution to this incident. Barbara, take care. Hugs to you and your beautiful family! I think it would be good to have Charlie read this one. He loves your writings and in his current state of Irreverence For All Things In General, he could use some sobering words from the heart. Let’s pray this all ends soon. i know, your sweet boy texted me. he was up till 5 keeping watch……wish i could scoop up all the college kids i love in this town, and bring them here for whatever comforts them. that would help ME actually…. Barbara, We are all worried about you, and all our friends in Boston. Please stay safe. It shall pass. The time between first hearing of the violence early this morning and now seems endless to me and I’m hundreds of miles away. It must seem tortuous to you right there in the thick of it. Holding you and yours and all of Boston, Cambridge, Watertown, et al in prayer. anxious for you there in your aerie. Glad your sweet boy knows how to take care of his mom as well as she takes care of him. I feel like I know what life is like there reading this, how close it all is, how visceral, how you feel it through your senses. So sorry you had to do this great reporting but it is great reporting. Glad it distracted you. Thinking of you. so relieved to know you are all safe and sound there. been thinking of you all week + sending virtual hugs. oh, honey, i have been thinking and thinking of you. i miss you. sent you a long email some months ago. might never have landed in your cybermailbox. i cannot tell you what comfort it brings to find you here. we’ve been holding up all day, but when the firetruck pulled up on the street below, and the sirens hit full wail (at the moment they realized they’d found the guy in the boat a few miles from here), poor teddy finally melted. it was heartbreaking. better now as we wait out what we hope are the final peaceful hours of this lockdown…. Resolution. I write this at 9:46 pm. About 24 hours after this mayhem broke out. Praise to the officers. Prayers for those who died, were injured, suffered trauma.